An explosive wildfire that roared with little warning into a Northern California city claimed a second life and thousands more people abandoned their homes, some of them slipping out just ahead of the walls of flame, authorities said Friday. 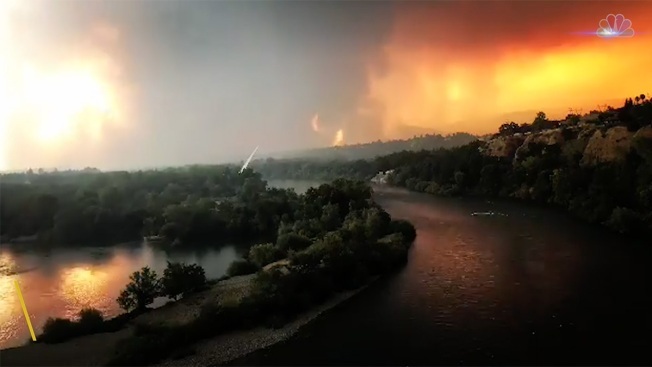 A firefighter with the Redding Fire Department was killed in Shasta County, officials said Friday. Another firefighter hired to try to contain the flames with a bulldozer was killed Thursday, authorities said. The fire is "taking down everything in its path," said Scott McLean, a CalFire spokesman for the crews battling the blaze. "We're not fighting a fire. 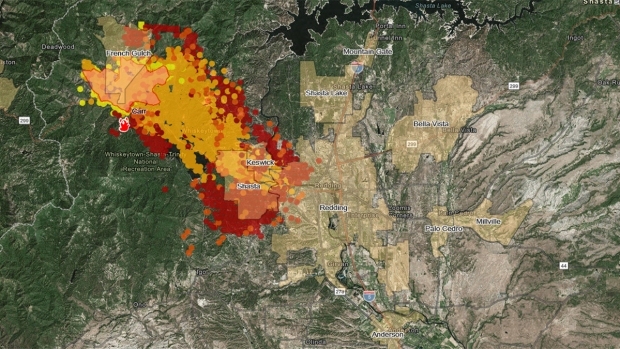 We're trying to move people out of the path of it because it is now deadly, and it is now moving at speeds and in ways we have not seen before in this area," said Jonathan Cox, battalion chief with Cal Fire. Mike Mangas, a spokesman at Mercy Medical Center, said the hospital was evacuating six babies in its neonatal intensive care unit, which cares for premature newborns, and taking them to medical facilities outside of the area. Brett Gouvea, incident commander of the crews battling the fire, urged residents to pay close attention to the blaze, which he said was "moving with no regard for what's in its path." "I've never experienced something so terrifying in my life. Nothing could prepare you for something like this," Williams said. She loaded up her 11-year-old daughter and her boyfriend's 9-year-old, but she didn't get far. She was promptly stuck in traffic as all her neighbors crowded the main road out. Cars honked and backed up. Drivers and police yelled at each other. "Finally I just went to the left and jumped up on the sidewalk and drove," Williams said. She estimated that it took an hour to go a little over a mile. She wanted to get as far away as possible, but ultimately stayed with her boyfriend's family in a safer part of town. Steve Hobson was one of the last to leave Lake Redding Drive. A former urban and wild land firefighter three decades ago, he planned to stay behind to save his house. But the heat burned his skin, and the smoke made it hard to breathe. 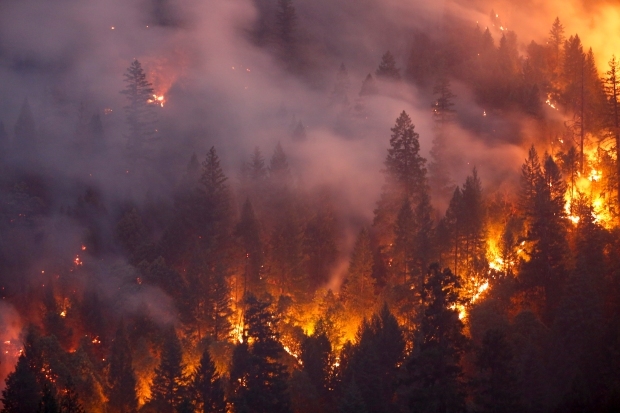 He could feel the fire sucking the air from around him, whipping up swirling embers in a "fire tornado," he said. "I didn't know if I'd make it so I just got in the middle of the street, went down the middle of the street through the embers and the smoke and made it past," Hobson said. 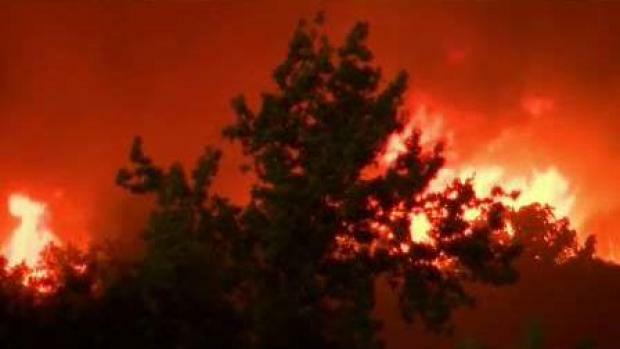 Meanwhile in the southern part of the state, a man was charged Friday with intentionally starting nine fires, including a wildfire that grew to 11,500 acres Friday morning, forcing thousands of evacuations in Riverside County, NBC Los Angeles reported. AP reporters Noah Berger, Brian Melley, Olga Rodriguez, Alina Hartounian, Marcio Jose Sanchez and John Antczak contributed.